While I love cookbooks in general, there are two types that I consider my favorites—the "personal" kind, aka the kind that tell stories behind the food, share memories, personal photographs and history and the "technical" kind, aka the kind that go deeper into the what, how and why of the ingredients, methods, and recipes techniques. 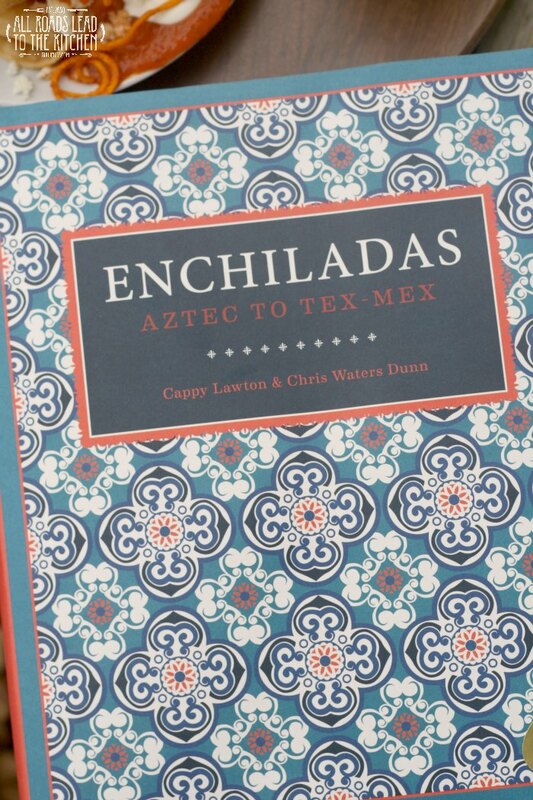 Enchiladas: Aztec to Tex-Mex by Cappy Lawton and Chris Waters Dunn is one of the latter. 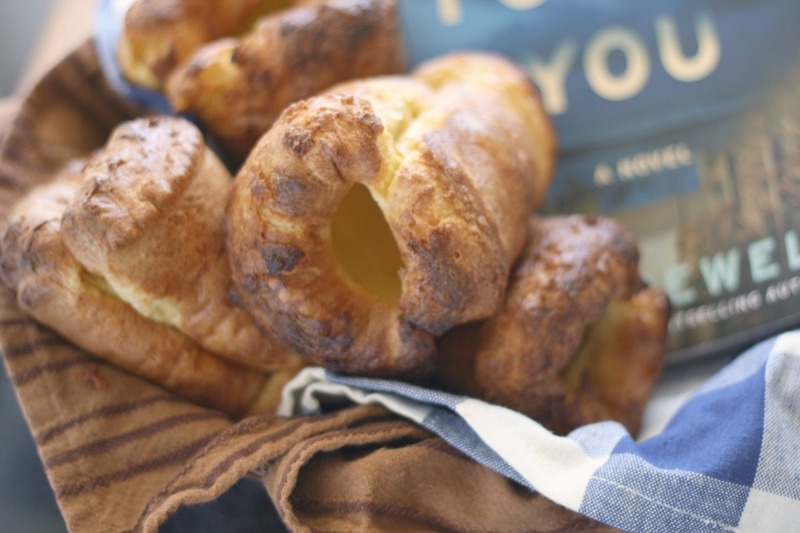 I'm happy to be hosting today's blog tour stop for this beautiful cookbook. 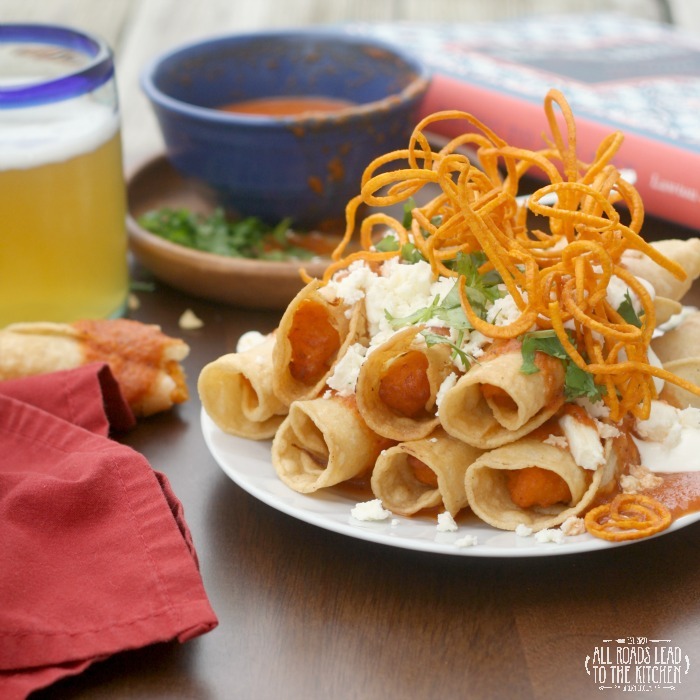 Large and filled with tons of recipes and ideas for authentic enchiladas, this book is a welcome addition to the Mexican food afficionado and the home cook who likes to delve a little deeper and familiarize themselves with authentic ingredients and techniques from another culture. You may know that Mexican cuisine is my favorite, always has been. 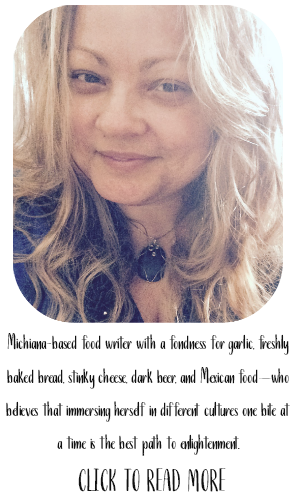 Even before I met my (Mexican) husband, I was studying under Rick Bayless. I mean, he didn't know it, but he was my mentor. I spent hours studying Authentic Mexican and Mexican Kitchen. When Mexico One Plate at a Time came out on PBS, I watched it religiously and practiced the recipes from the cookbook of the same name. 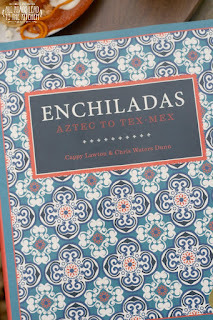 Just as his books appeal to the knowledge and technique-hungry side of me, so does Enchiladas. 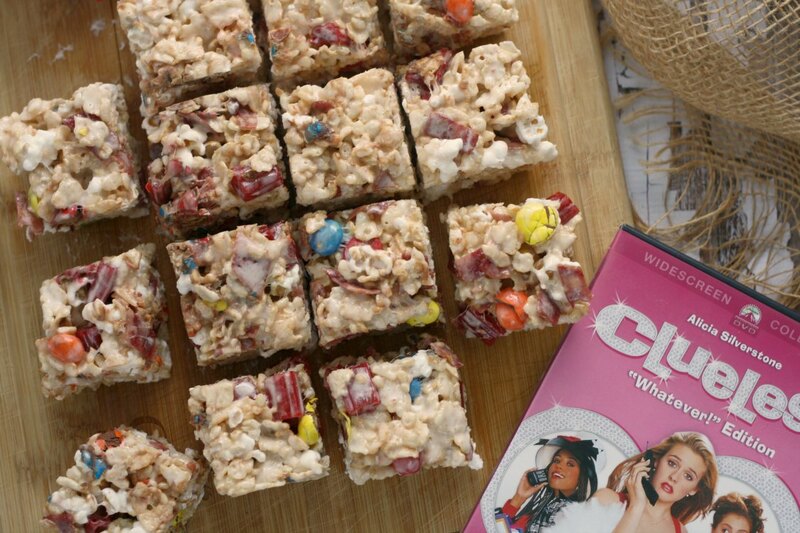 The 75 pages that preceed the official recipe section contain background, knowledge, and instruction to help you be successful when using this book. Part 1 talks about commonly used ingredients in Mexican cooking, such as the fact that chiles seeds have been found at archeological sites, indicating that indigenous people have been eating chiles for at least 9,000 years. You learn how ingredients are used in modern Mexican cuisine, a well as how to prepare and/or make certain ingredients or components of a dish (such as Crema, Chorizo, and Cecina). 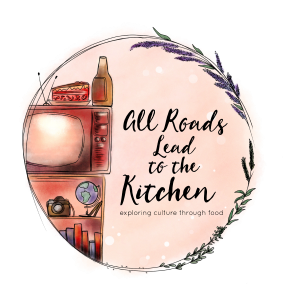 Part 2 talks about fundamentals like making corn tortillas, roasting chiles, preparing beans and rice, preparing meats for, plus assemling and garnishing enchiladas. I recommend giving yourself some time to read and explore these two sections before moving on to the recipes. Doing so will not only prepare you, but also drive your hunger for authentic enchiladas. When you're ready to start cooking, the hardest choice will be which recipe to make first since you can choose from a variety of fillings, methods, and origins. While there are tempting photos scattered throughout the book, not every recipe has one...and most don't have an introduction, either. This is my only complaint. While I do consider this more of a technical cookbook, it would be nice to have at least a small introduction paragraph to each recipe. For example, while I know that a recipe titled "Enchiladas Queretanas" means in the style of Querétaro (because that happens to be where my husband is from), I'm guessing that my neighbors would not know that. 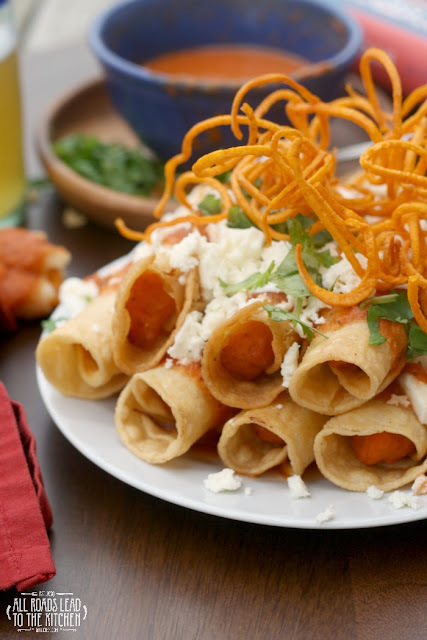 It would be great to have even a few sentences explaining the name/origins of each enchilada. The enchiladas from this book that I am sharing with you today threw me for a loop when I first read the recipe because the method called for rolling and frying them in the manner that I make flautas. 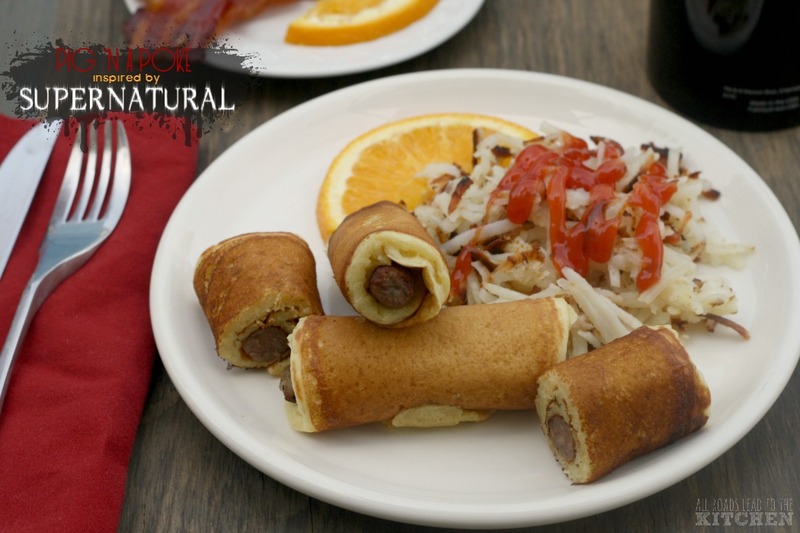 Hmmm, crunchy rolled tacos was more like it. And I continued to think this way until I actually took my first bite. While flautas stay crisp, these enchiladas actually turned soft once the (utterly delicious) chipotle sauce was poured over them. I'm thinking it had something to do with the sweet potato filling—it must not hold up the way a meat or bean filling does. Anyway, they're so tasty. 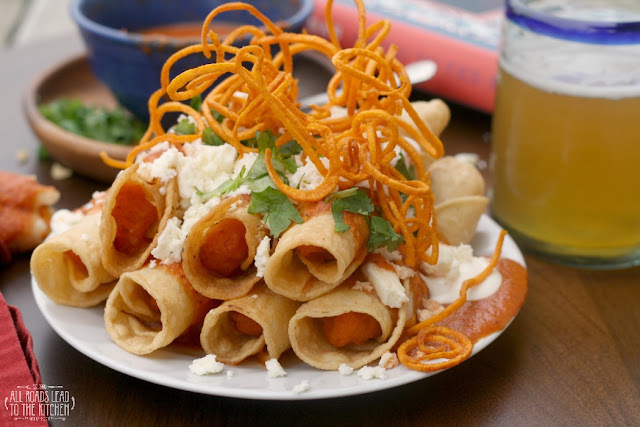 Soft, mashed sweet potato inside a toothy corn wrapper, drenched in an earthy, smoky sauce and then topped with a garnish of crema, queso, cilantro (my addition), and the fun addition of crisp sweet potato strings! So, pick up this book for yourself or the cook who enjoys diving a little deeper into their food and doesn't mind spending a little time in the kitchen. It would be a valuable addition to the bookshelf of anybody who loves learning more about Mexican (or any ethnic) cuisine. 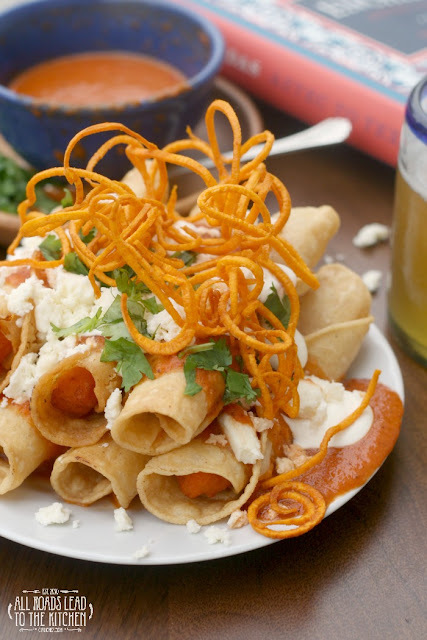 A simple sweet potato filling is tucked inside these enchiladas that are made in an unexpected way before being smothered in an earthy chipotle sauce and garnished with fried sweet potato strings. Preheat the broiler. Place the tomatoes in a single layer on a baking sheet. Place under broiler until very soft and blackened in spots, turning as a side is done, 15 minutes or so total. Remove from oven. In the meantime, eat the oil in a small skillet over medium heat. Add the onion and cook until translucent, 3-5 minutes. Add garlic and chipotles to skillet and cook for another 1-2 minutes, stirring almost constantly. Remove from heat. Transfer the tomatoes and any accumulated juices to the jar of a blender, then scrape in the onion mixture and add the salt. Puree until smooth. Strain through a medium-mesh strainer. If proceeding immediately, pour the sauce into a saucepan over medium-low heat, cover, and keep warm (reheat in the same manner if made in advance). Store cooled sauce in an airtight conainer with a lid in the fridge for up to 5 days. Cut the tip off the narrow end of each sweet potato to keep it from bursting. 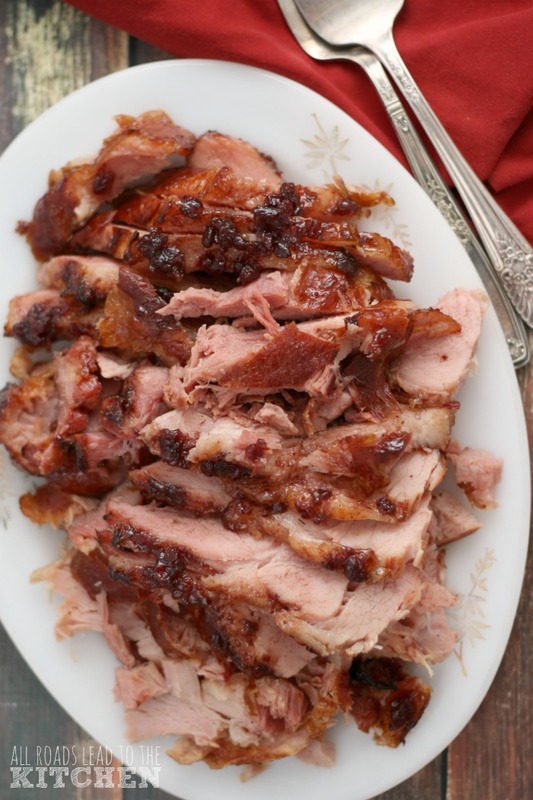 Place on a foil-lined baking sheet in a 400° F (200° C) oven for about 1 hour, or until fork-tender. Cool for a few minutes. Once the sweet potatoes are cool enough to handle, peel and pass through a food mill or ricer to achieve a smooth consistency. Add salt to taste. Preheat the oven to the lowest temperature it will go to (to keep warm). In a deep skillet or Dutch oven, pour oil to a depth of 2 1⁄2 inches (6.33 cm) and place over medium-high heat. Bring to medium frying temperature (about 350° F, 177° C). To soften the tortillas, wrap them in a clean kitchen towel, place in a plastic storage bag (do not seal), and microwave on high for 45–60 seconds. Place 2 tablespoons sweet potato purée on the lower third of a tortilla, roll, and skewer with a toothpick. Repeat with the remaining tortillas. 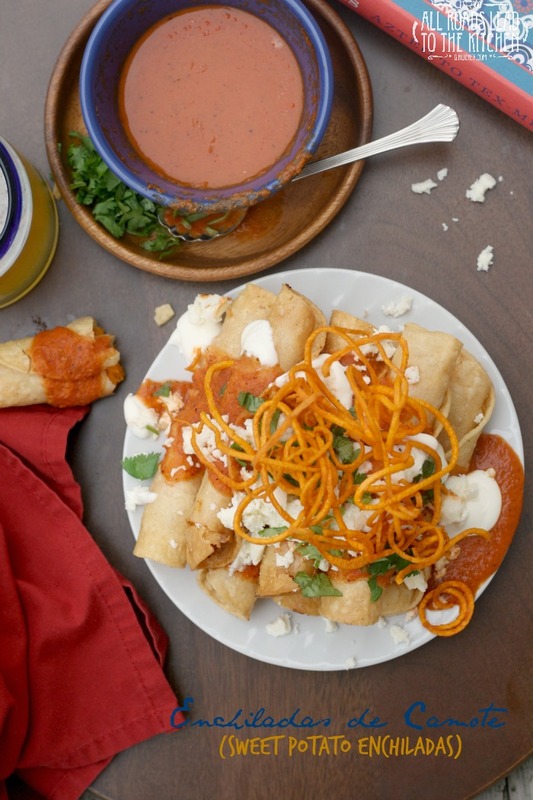 Deep fry the enchiladas a few at a time (do not crowd) until crispy. Drain on paper towels and place on an ovenproof platter in the oven to keep warm. Continue frying the remaining enchiladas (allow the oil to reheat to frying temperature between batches). When ready to serve, remove the toothpicks, place 2–3 enchiladas per serving on warm individual plates, top with the chipotle sauce, and garnish with crema Mexicana, queso fresco, fried sweet potato strings, curls, or slices and cilantro. Using a mandolin slicer, slice a peeled, raw sweet potato into very thin, long slices or shred into strings; you could also use a spiralizer to make curls (like I did). Just before serving, place oil that has been heated to 350° F until golden, drain on paper towels, and use as a garnish. -Reprinted with permission (and slightly adapted) from Enchiladas: Aztec to Tex-Mex Copyright © 2015 by Cappy Lawton and Chris Waters Dunn. published by Trinity University Press. fun features: I love cookbooks that set a foundation for home cooks that are looking for more than just simple recipes. Since the recipes in this book are a bit more in-depth than beginners may be used to, part 1 and part 2 are introductions to ingredients found (and how to make or prepare them, if necessary) and the fundamentals of enchilada making (which when making authentic enchiladas is more than stuffing something inside of a tortilla, topping it with sauce and cheese and sticking it in the oven. Far more.). about the authors: Cappy Lawton has designed, developed, and operated twenty-nine restaurants throughout Texas. After studying business and engineering at the University of Texas at Austin and having a successful career as an aeronautical designer, he entered the restaurant business. Lawton and his wife, Suzy, love food and travel and have spent many years traveling throughout Mexico. Today the Lawtons and their son, Trevor, own and operate three restaurants in San Antonio: La Fonda on Main, Cappy's and Cappyccino's. Chris Waters Dunn is a San Antonio native and holds a graduate degree in creative writing from the University of Denver. Dunn worked for decades in Nashville as a songwriter and record producer. As Chris Waters, he wrote dozens of hits, including nine #1 county songs. Dunn retired from the music business to pursue a second career in culinary studies, graduating with honors from the Culinary Institute of America. One copy of the Cookbook, Corn Tortilla Mix, Black Beans, Piloncillo, Abuelita Chocolate, Chile de Arbol, Avocado Leaves, a Tortilla Basket, and a Tortilla Press.